American department store based in Baltimore. 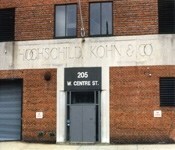 Started in 1897 by Max Hochschild, Benno Kohn and brother Louis B. Kohn. It went Bankrupt in 1983 and was listed in the National Register of Historic Places in 2003.